"The tax deals which Switzerland reached last year with Britain and Germany could yet fail in the face of opposition in Europe and in the countries concerned." There's opposition, too, from amongst the Swiss political parties, with some on the Right concerned about the gradual erosion of banking secrecy, while those on the Left see a move towards enhanced information exchange (i.e. automatic information exchange on the EU model) as an inevitability. "It is now by no means certain that the two tax agreements will pass the hurdles of the Swiss parliament either. But he sees things moving now in the direction of the automatic exchange of information". 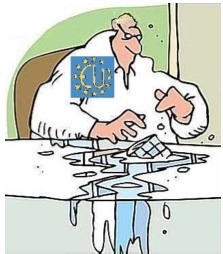 "that the EU already has legislation regarding withholding taxes on interest. As EU legislation has primacy over bilateral agreements, no EU member State can enter into agreements that impinge on the EU savings tax. The withholding taxes levied under the EUSD are merely advance payments against what would ultimately be owed by the taxpayer. Therefore Rubik cannot be regarded as a full and final settlement. The tax evader client can still be liable to penalties, etc. This defeats the one and only purpose of Rubik. Rubik is crippled." In other words, the key selling point of Rubik is that it enables tax-evading criminals to get off the hook (while paying taxes and back taxes) - but the EU will ensure that even if they do pay those taxes, they are still on the hook. Switzerland has been trying to play some weird little gymnastics behind the scenes to try and get around the EU's objections - by excluding bank interest from the bilateral deals (story only available in German, here, with rough web translation here) - but these typically Alpine subterfuges don't appear to address the core problem here. The whole game is a nonsense. TJN's position is unambiguous: these deals are weak, immoral, and even silly - and they undermine international attempts to tackle tax evasion. Both Germany and Britain should swallow their pride, withdraw from the deals, and put their diplomatic effort into pushing through the EU's enhanced Savings Tax Directive - suitably extended to Switzerland.